PT Bank Rakyat Indonesia Agroniaga Tbk - Bank BRI AGRO or widely known as "BRI AGRO" is a well-established public-listed company in Indonesia, running business in commercial banking industry. Based in Jakarta, BRI AGRO has strong business focus on agribusiness segment. PT Bank Rakyat Indonesia Agroniaga Tbk is a directly-owned subsidiary company of state-owned lender PT Bank Rakyat Indonesia (Persero) Tbk (BRI Group). At present, BRI Group holds 87.23% shares in BRI AGRO. Other remaining shares in BRI AGRO was owned by DAPENBUN (7.08%), and general public (5.59%). BRI AGRO has 1 operational head office, 18 branch offices, 20 sub branch offices, 4 cash offices, and directly employs nearly 640 staff. 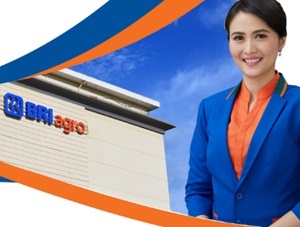 In term of financial positions, BRI AGRO posted a positive financial result in business year of 2016. , According to information found in PT Bank Rakyat Indonesia Agroniaga Tbk Annual Report 2016 as cited by JobsCDC.com, BRI AGRO managed to record total assets of Rp 11,337.96 billion in 2016. This total assets figures reflected an 36.02% increase from Rp 8,364.50 billion in the previous year. Total income for the year 2016 booked a 27.96% growth, reaching Rp103 billion from Rp 80.49 billion in the same period at previous year. Minimum D3 in Accounting, Management, Law, Information Technology, Information System r other related major relevant to banking industry. Maximum age of 27 years old for those who have experience. Excited and eager to learn. JobsCDC.com now available on android device. Download now on Google Play here. Please be aware of recruitment fraud. The entire stage of this selection process is free of charge. 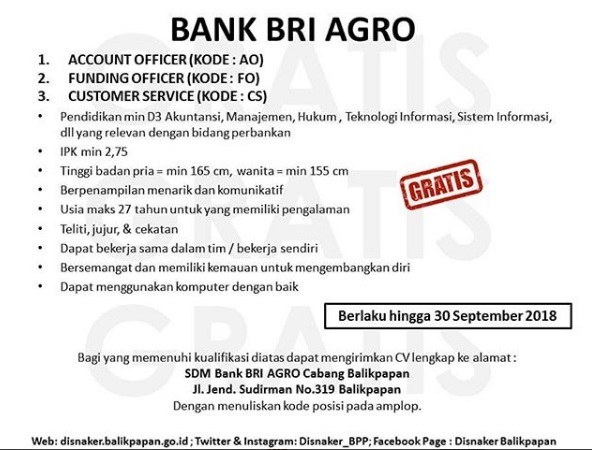 PT Bank Rakyat Indonesia Agroniaga Tbk - D3 CS, AO, FO BRI Group September 2018 will never ask for fees or upfront payments for any purposes during the recruitment process such as transportation and accommodation.